This Mod is based on SMAPI 1.8+, for installing SMAPI refer to https://smapi.io/. For installation unpack the zip-File in the Mods Folder, just like any other SMAPI Mod. 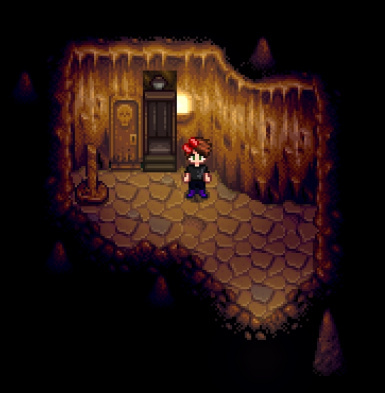 An elevator like in the normal mine is added to the Skull Cavern, like in the normal mine the elevator is updated every 5th Floor by default. Note: The elevator is always placed to the right of the ladder. In the folder SkullCavernElevator there will be a file called config.json after starting the game with the mod, in this file you can change how frequent the elevators appear. You just need to change the value behind the "elevatorStep" : (the 5). A new setting called "difficulty" has been added to the config.json file. It changes the number of elevator levels appearing in the menu. The value is calculated as follows: deepestMineLevel/elevatorSteps/difficulty. A few examples to illustrate how difficulty and elevatorStep work. In all examples it is assumed that the lowest mine level reached is 40. First elevatorStep, this changes step width between elevators appearing. Difficulty setting changes how difficult it is to travel further down with the elevator. As you can see, a higher value in Difficulty means that less elevators appear and you need to get further down to unlock new elevators. 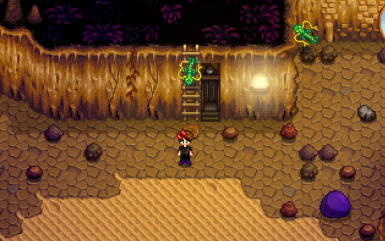 Difficulty 1.5 and elevatorStep 10 means when you reach level 40 of the SkullCavern, you will only see elevators up to level (Lowest Level/Difficulty[1.5]) 26. Means elevators: 10 and 20. (due to the elevatorStep of 10).